Even a cursory examination of the Gospels, even the most superficial comparison of the teachings of Jesus Christ and the words and actions of the #BLOTUS, is enough to see how great and how deep the chasm between the two. Donald Trump is the perfect example of how a nonbeliever speaks and acts. Discipleship and faithfulness to Jesus Christ is a way of life. It’s a lifestyle that is both observable and easily identifiable. 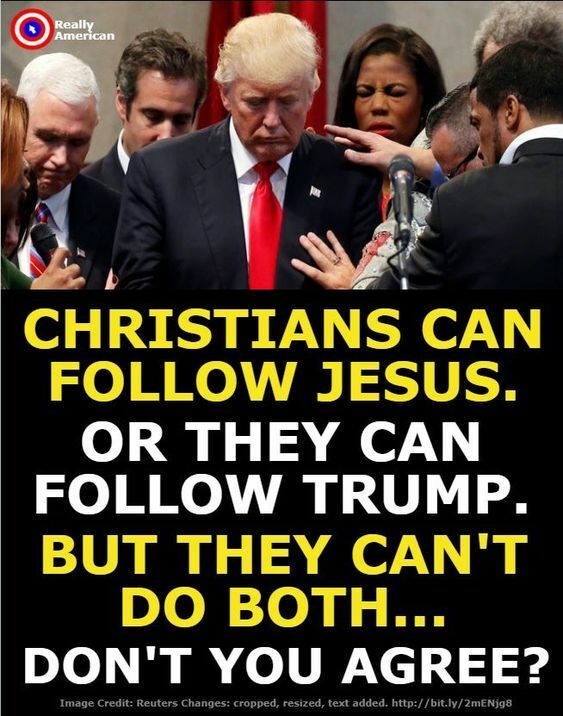 Anyone who honestly believes that Trump is a Christian, or even a good person, has no concept of who Jesus was or what he demands of those who follow Him. The fact that over 80% of white evangelicals voted him into office speaks volumes about the lack of Biblical literacy in our nation. The continued support given to him by those in the church should be a wake-up call for believers everywhere. How anyone can follow the Christ of the Gospels and support Donald Trump is literally beyond my limited comprehension. I am willing to be enlightened, but I will readily admit I will take some serious convincing. This entry was posted in Hunger & Poverty, News & Views, Quotes, Spirituality & Religious Writings and tagged actions, Biblical literacy, BLOTUS, comprehension, convincing, dichotomy, discipleship, divide, enlighten, faithfulness, gospels, Jesus, lifestyle, opposition, perfect example, teachings, Trump, white evangelicals, words on January 22, 2018 by Ray Buchanan.